10.02.2017 | Los Angeles, USA – Screaming O has completed and passed its latest round of product materials testing and proudly confirms that its bold SEBS, brightly hued ABS plastic, and soft PU coating exceed requirements set by the Consumer Product Safety Improvement Act. These three materials are found in Screaming O’s newest products and, as expected, have been established via independent testing and third-party validation to be safe for consumer use. Using the services of independent laboratory Polymer Solutions, the three materials underwent Screaming O’s now signature three-step testing process customized to determine material authenticity, non-toxicity, and body-safety. The company is proud to report that the colorful ABS used in new Charged Vooom Bullets, bold SEBS used in the new Yoga vibrating ring, and smooth PU coating found on the groundbreaking Charged Positive vibe passed all three tests. Screaming O conducts these semiannual materials testing reports as part of its commitment to customers, retailers and consumers of all kinds. The company contracts Polymer Solutions, an independent laboratory, and a separate third-party verifier to maintain regular testing of each material in its catalog and is now testing most products prior to their industry releases. In addition to securing consumer trust, this testing initiative also sparked an evidence-based conversation regarding the safety and quality of its affordable materials. Previous testing phases confirmed that The Screaming O’s popular SEBS, True Silicone™ and original ABS plastic were authentic, body-safe and non-toxic. As part of its commitment to transparency, Screaming O also has confirmed that an expectedly small amount of phthalate was detected in the PU coating. Used to achieve a premium level of softness, this phthalate was found to be at a concentration far below standards set by the Consumer Product Safety Improvement Act of 2008 and is a common and approved plasticizer found in most products made of or containing polyurethane material. Screaming O uses a universal labeling system on all new packaging featuring icons that quickly and clearly inform shoppers of what each product is made of. The production team will update the next batch of packaging to accurately reflect these new findings, and Screaming O encourages retailers and customers to adjust their own marketing copy to ensure that their descriptions correctly represent the brand’s products to the shopping public. “In the two years since we started our materials testing initiative, we’ve learned so much about the composition of myriad product materials on the market and this knowledge has given Screaming O a unique opportunity to educate while being 100% transparent,” Aumann said. 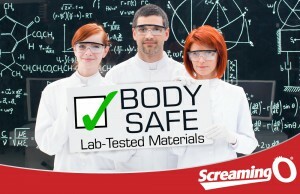 “We value our relationships along the supply chain, as well as those we’ve created with Polymer Solutions and our third-party validator, and we appreciate the opportunity to share our findings with the public.” For more information about Screaming O’s materials testing program or its product line, please visit www.screamingo.com.